Hoodoo, Hoodoo you think you’re fooling? I have had Love Me Like a Rock stuck in my head for days. I know the song is really Who Do? not Hoodoo, but ever since I heard about hoodoos, it’s been on my mind. 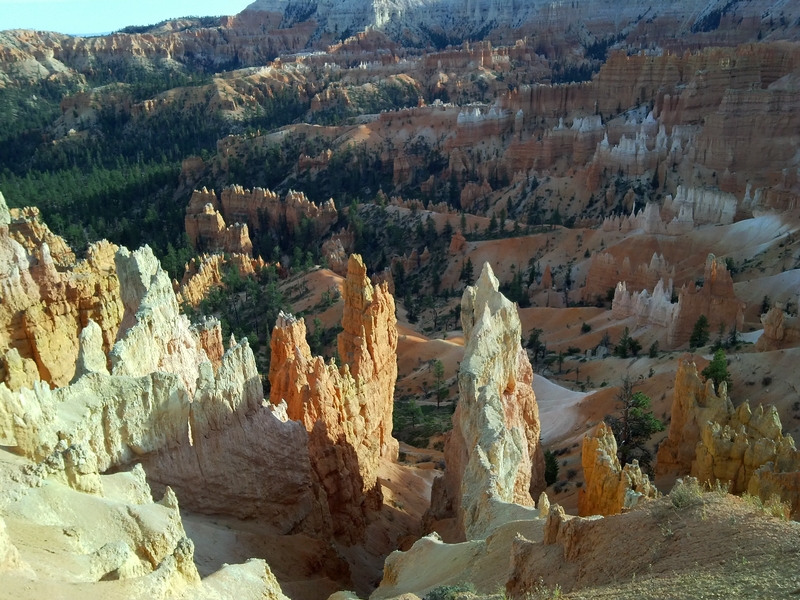 Hoodoos aren’t found very many places, but there is a huge cache of them at Bryce Canyon National Park in Utah. Bryce Canyon is made almost entirely of limestone, it has the same colors of many of the other red rock canyons that are typically sandstone or granite, but the rocks are limestone here. There are thousands of spires on the canyon floor that rise straight up and usually have a knob on the top. These are called hoodoos. No where are they more prevalent than in Bryce. Our National Parks are a great resource for all of us to enjoy. I find the easiest and least expensive way to enjoy them is with an Annual Pass. For the price of $80, you can enjoy admission in to any National Park for free. We’ve certainly gotten our monies worth, just going to Glacier, Yellowstone, Bryce Canyon and Zion covered that cost. When you add in the Petrified Forest, Arches, and Canyonlands, we’ve come out way ahead. And, if you don’t already have a pass, plan a visit over Veteran’s Day weekend where the entrance fee at all parks is FREE. Some of the National Parks are free, but they get you with “concessions.” Like, Mount Rushmore, you can go to the Mountain for free, but you have to pay for parking; or the St. Louis Arch, admission in to the bottom of the arch and the museum is free, to get to the top costs you. Your annual pass won’t take care of either of those costs. But still, well worth the money spent. I think it’s much easier for those of us in the mountainous west to enjoy the parks system, we have so many great parks available within a days’ drive of most anywhere. If you get the chance this year, now is the time to go, the crowds are down, the weather still good and the sights are gorgeous. I love National Parks. I love National Parks, I visit them every opportunity I have. My favorites include Yellowstone,Yosemite, but also, anywhere that land has been set aside for the public to enjoy. I am about conservationism, although I am not an environmentalist. I believe that public lands are for all of us to use, whether we are riding or walking on that land. Big used to live within an hour and a half of the Grand Canyon, and yet never made the trip, so when we had an extra day in Arizona this week, I pouted until we went. The Grand Canyon is one of those incredible works that not only has the natural beauty that the national parks are known for, but also a partnership with the locals so that people actually live on the park property. It was late in the 19th century when the Grand Canyon was discovered, many private enterprises began not long afterward. It wasn’t until the area was designated a National Park in 1919 that those enterprises slowed, although they never really stopped. Over five million people access the rims of the park to view the dramatic landscapes, and many more travel along the bottom, either rafting the Colorado or hiking from the rim to the floor and back again. The park service works very hard to limit the number of vehicles that pollute the area and provide bus rides to all areas of the park to streamline the congestion. The other thing the Park has done well is create walking trails along the south rim to provide an area for visitors to use. It was amazing to me that in late October, late on a Sunday afternoon, there were still a ton of people around. I thought the tourist season was over, but apparently no one told the folks going to Arizona that the season was over. It was awesome. The Canyon itself is as dramatic as ever, over one mile deep, it was carved by the Colorado River. The rocks are over 190 million years old, at the bottom of the canyon. The oldest human artifacts date back almost 12,000 years. The views are incredible and always worth a stop to look over the canyon’s edge. Plan your trip now, don’t expect that there will always be another time, who ever knows what the future holds, not for the Canyon, I’m pretty sure that isn’t going anywhere, but you may. I’m so glad we went. Do you sometimes have thoughts that you are afraid to share out loud? I’ve been told that blonde is not a hair color, but rather a state of mind – most days, I’m definitely blonde. We were cruising through the Petrified Forest National Park the other day and Big saved me from being blonde – you see, he said what I was thinking first. The Petrified Forest was created millions of years ago when the elements were just perfect. There were floods combined with silica that created the perfect environment for petrifying the wood. The minerals that were prevalent at the time are what created the various colors. The conditions haven’t existed to recreate the petrification process since. There are many stops along the main trail through the National Park, they all show the same woods, but feature other elements too. There is the Crystal Forest, where quartz and other minerals are formed within the hollow of the tree; Newspaper Rock where the petroglyphs can be seen from the overlook; Puerco Pueblo, a stone pueblo that can be found along the north end of the park, inhabited by the Indians that inhabited the area centuries ago – just watch out for the aggressive bees. Our favorite thing to do when we travel is talk to people. The topic of today was “Who cut up those logs?” You see, all of the petrified logs were “cut” into firewood size pieces. I mean, every one – it was fascinating, and there was no obvious explanation. I’m sure if we had asked the rangers, they would have given us an explanation regarding stress fractures in the stone. But we enjoyed the ones we got from the visitors more. “Paul Bunyan did it” or “The Indians bucked it all and just didn’t get around to gathering it” Everyone had a theory, but even better, everyone asked the question – I didn’t feel so blonde after all.